A gym, dishwasher, granite countertops… What features do you look for when considering a rental apartment? A recent study conducted by the National Multi Housing Council (NMHC) and Kingsley Associates includes the feedback from nearly 15,000 apartment residents from across the United States on what their most desirable building and suite amenities are. The NMHC are champions at advancing the multi-family apartment rental industry in innovative ways and we often look to our neighbours down south for insights on improving our operations and customer service. 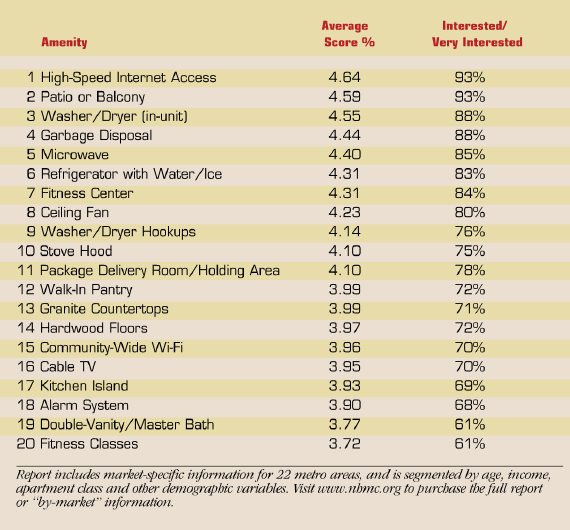 According to the survey, high-speed internet access and a patio or balcony top the list of most desirable amenities for apartment residents. How do you feel about the results below? Do they fall in line with your desires and values? At Hollyburn, we welcome resident feedback. We also offer customized suite upgrades and renovations. Let us know your thoughts at [email protected], and we will do our best to address your concerns or requests and ensure you’re loving living at Hollyburn!